We know that some viruses cause joint pain and inflammation (swelling, redness, and heat). Researchers have wondered for a long time whether some kinds of arthritis with unexplained causes may be the result of a virus. So far no one knows, partly because the virus itself may be long gone before a patient ever develops the pain and inflammation of arthritis. Where does viral arthritis develop? Most viral infections in the body cause a limited illness. Then the body's immune system destroys the virus, and the symptoms of the illness go away. In viral arthritis, the immune system's response to the virus causes inflammation in the joints. Even after the virus is eliminated from the body, the changes in the joint can continue to cause pain and swelling. The joint may even become permanently damaged. 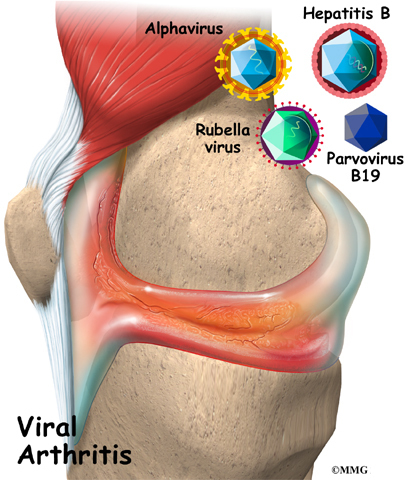 Which viruses cause viral arthritis? Several viruses are known to cause problems with joint inflammation and pain. Some of the most common are listed below. Parvovirus B-19 is a common virus. About 60 percent of adults have been infected with it at some point in their lives. Parvovirus B-19 causes the illness called fifth disease, which causes a rash on the face and body. People usually get fifth disease as children. About 15 percent of children with fifth disease have some kind of joint pain, which usually goes away quickly. Almost 80 percent of adults who get fifth disease report sore joints within three weeks of the infection. Any joint can be involved, but usually it affects the foot, hand, knee, wrist, and ankle joints on both sides of the body. Most of the time the joint pain clears up in about two weeks, but it has been known to come and go for as long as ten years. Hepatitis B infection, which causes severe inflammation of the liver, can cause a severe and sudden form of arthritis that affects many joints on both sides of the body. The hands and knees are the most common sites, but the wrists, ankles, elbows, shoulders, and other large joints are also affected. The arthritis often starts before the jaundice (yellowness of the skin) of hepatitis, and it may last for several weeks after the jaundice is gone. For patients with chronic (meaning long-lasting) hepatitis, joint pain may come and go. Rubella, a mild but highly infectious viral disease, causes joint pain in many adults, especially women. Joint symptoms tend to appear within a week of the rash common with this disease. The joints are usually not inflamed, but they are stiff and painful. The hands, knees, wrists, ankles, and elbows are most commonly affected. The joint pain of rubella usually goes away within two weeks, but in some cases it can last for several years. The rubella vaccine also causes joint pain in about 15 percent of people. Joint stiffness occurs about two weeks after the shot and lasts for about a week. The vaccine has been known to cause more severe joint stiffness in some people, however, which can last for more than a year. Human immunodeficiency virus (HIV) is the virus that causes AIDS. It is connected to several different forms of arthritis. When people are newly infected with HIV, they often have flu-like symptoms and joint pain. About 10 percent of HIV patients have severe joint pain that comes and goes, mostly in the shoulders, elbows, and knees. Patients with HIV are much more likely to develop reactive arthritis, Reiter's syndrome, and psoriatic arthritis. In these cases, doctors aren't sure whether HIV actually causes these forms of arthritis, or whether the arthritis occurs separately. Up to 30 percent of HIV patients also suffer from fibromyalgia. In some cases, viruses that cause arthritis type symptoms can be carried by insects. Alphaviruses, one such family of viruses, are carried by mosquitoes in Africa, Australia, Europe, and Latin America. All can cause arthritis symptoms. How do doctors identify viral arthritis? There is no specific test for any type of viral arthritis. Your doctor will make the diagnosis based on other symptoms. Usually blood work and X-rays don't help. In many cases the diagnosis of viral arthritis is made after a search for other causes turns up negative and your symptoms or history suggest a virus as the cause. In most cases, viral arthritis runs its course fairly quickly. Your doctor may recommend a medication to help with the discomfort. Most of the time this will be an over-the-counter pain reducer like acetaminophen (Tylenol) or a nonsteroidal anti-inflammatory drug (NSAID), such as aspirin or ibuprofen. Your doctor may also recommend use of hot or cold packs on the inflamed joints and rest.